Experience the most iconic spacecraft in the Star Wars universe like you never thought possible. The Star Wars Millennium Falcon XL Drone from Air Hogs delivers unprecedented detail and authenticity. 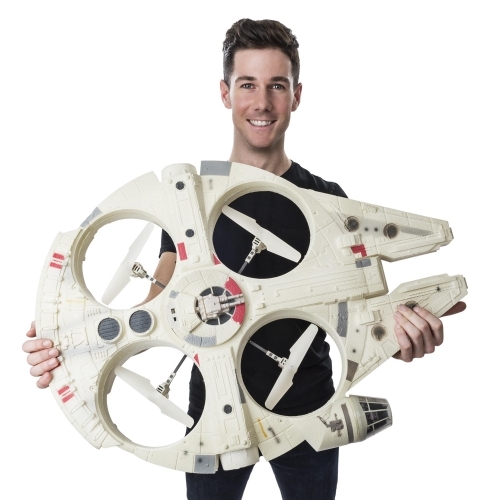 This colossal 27" long drone features a light-up cockpit complete with detailed Han and Chewie figures, LED subspace hyper drive, and authentic lights and sounds. Use the Star Wars themed 2.4GHz remote control with a flight data screen, an onboard barometric pressure sensor, and 6-axis gyro to pilot the Millennium Falcon XL Drone up to 250ft away.